Manual physical therapy techniques and acupuncture can be utilized to relieve significant pain and discomfort arising from secondary soft tissue tightness and muscle spasms. Can I Treat My Lower Back Pain With Acupuncture? Back pain is the most prominent problem in the United States workforce today. It is the second most common cause of missed workdays and the leading cause of disability in those ages 19-45. Eight out of 10 people will have back pain at some point in their life. Although most incidences will resolve themselves, many will become chronic. Most low back pain injuries are the result of slow degeneration from repeated stress. Repeated heavy lifting may cause a muscle strain or – in some cases – the disks between the vertebrae may rupture or herniate, which could create pressure on a nerve and cause severe pain. Diagnostic tests such as an MRI or X-ray usually determine the type of injury. Manual physical therapy techniques and acupuncture with modalities can be utilized to relieve significant pain and discomfort arising from secondary soft tissue tightness and muscle spasms. Incorporating acupuncture is remarkably effective in providing successful pain relief. Although electrical stimulation is commonly used in conventional therapy to reduce pain and relax soft tissue, the inclusion of acupuncture needles allows the stimulation to penetrate deeper and affect the involved structure directly. 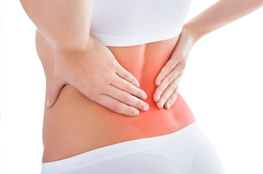 Physical therapy also has been shown to be extremely beneficial in the treatment of low back pain. Studies have shown that exercise stimulates the body's mechanism for reducing pain. People who regularly exercise have fewer back injuries and return to work in a shorter time. Modalities are used to increase circulation and reduce pain, as well as strengthen the back musculature. A well-trained physical therapist recognizes poor postural alignment as a predisposing factor to various muscular and skeletal conditions.